“My wife is constantly on the verge of breaking down. Whenever she sees our son, she can’t even stand without support. I’m trying my best to be strong for her and my son, but it’s so hard to even think right now. Nothing hurts parents more than seeing their child in pain. 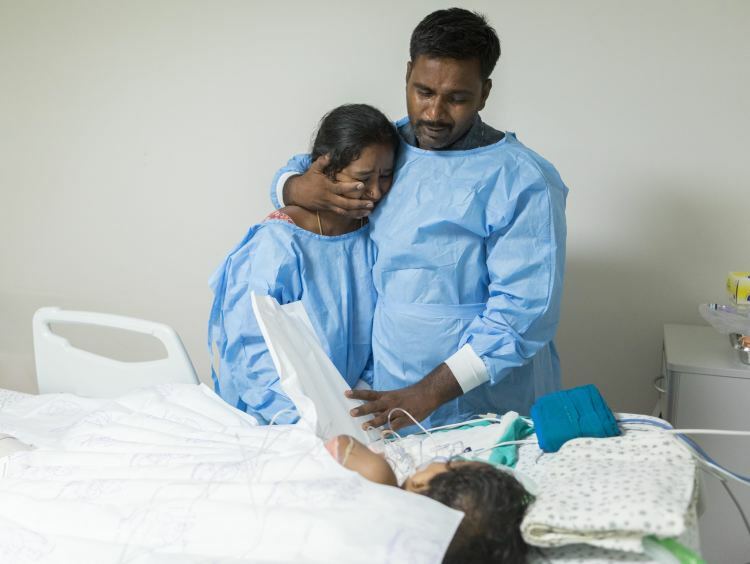 For Anita and Venkateshwarlu, this happened in the worst way possible, with Anita hearing her son’s near-death screams from getting burnt by boiling water. She couldn’t believe what she was seeing and would have fainted from the trauma if not for her motherly instincts kicking in instantly. Anita was preparing a bath for their 7-month-old son, Gnaneswar. She had just poured hot water into a small tub right outside their house and went inside to get cold water to add to it. Baby Gnaneswar was crawling in the house like he usually did and before she knew it, he was near the water tub. She came back from the house and right in front of her eyes, her baby fell into the hot tub, and let out a loud wail of pain. She acted swiftly and picked him up from the tub of hot water. But even the brief touch of scalding hot water had burnt him. His skin was raw and baby Gnaneswar wouldn’t stop wailing. Anita immediately called Venkateshwarlu home. 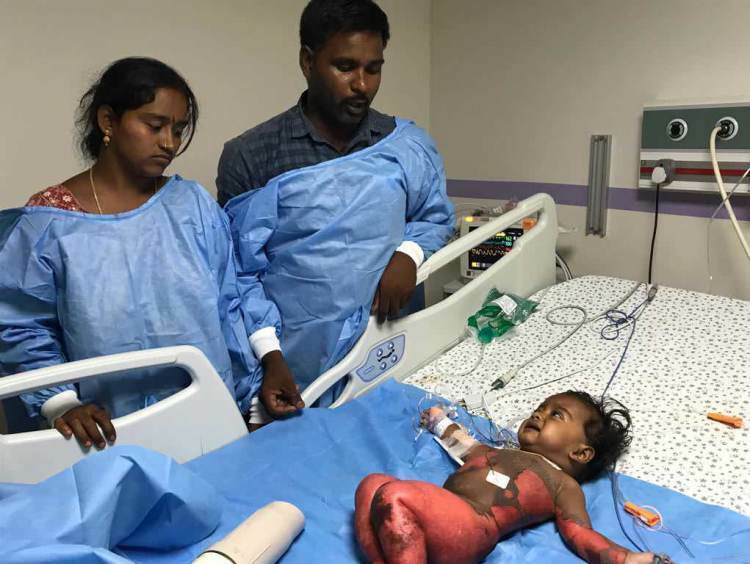 Venkateshwarlu reached home in a rush, he saw the baby's skin burnt. His skin was pink and starting to peeling off. There were blisters coming up on his skin. Without delay, they rushed him to a nearby hospital. But the baby needed ICU where he could be safe from contaminations. Gnaneswar was under a serious risk of getting infected and Venkateshwarlu was not willing to take any chances with his son’s life. 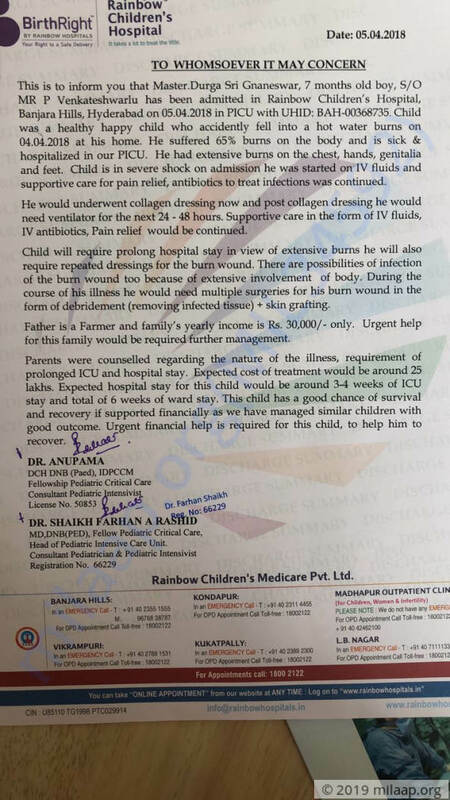 They then got him to Hyderabad from their village and admitted him to Rainbow hospital. 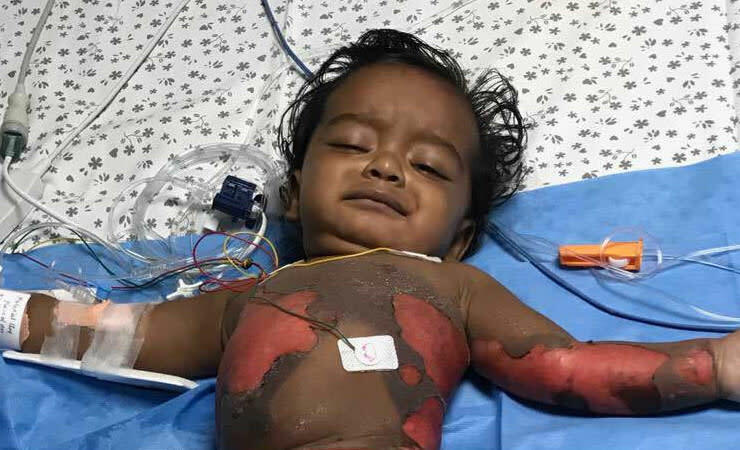 He had suffered 65% burns, with his chest, hands, feet, and pelvis severely burnt. He was immediately taken to the ICU where he is getting treated currently. He needs aid with everything, so he has been put on oxygen, and for his nutritional needs, he is dependant on saline drips. “Everything was fine in our lives, but misfortune had to strike in such a way that our lives have changed forever. 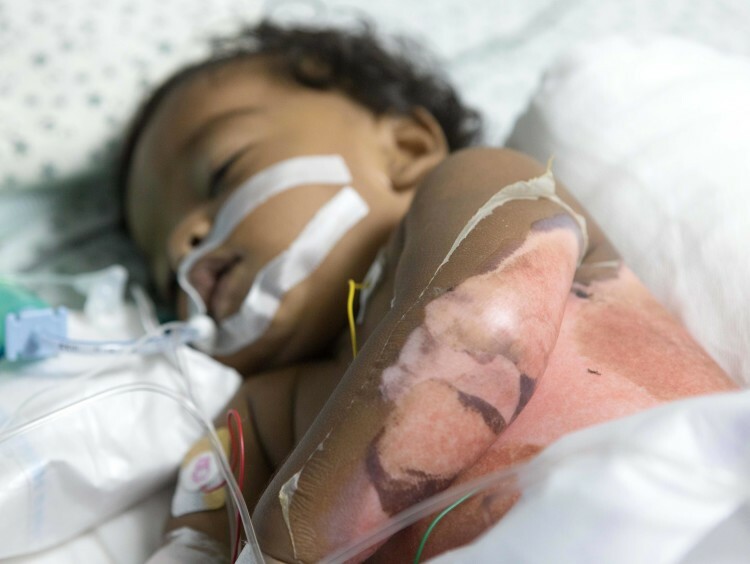 No parent should have to see their baby writhing in pain and wailing due to pains from burns. All we want is for him to stay alive and recover from this." Anita is living her worst nightmare. 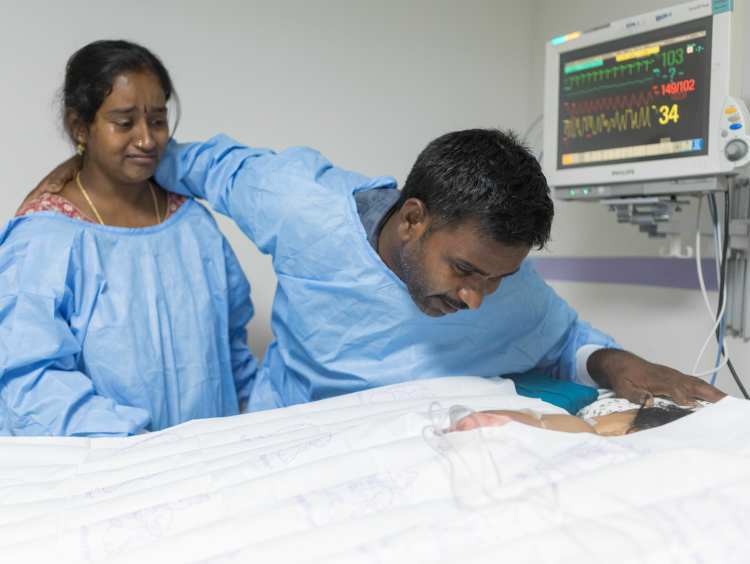 Her son in the ICU, under strict medical supervision. He is kept unconscious because he is in too much pain. She can’t wait to pick him up and hug him, but she is not even allowed to touch him. The couple can’t believe how misfortune has wrecked their lives. It’s not the first time Venkateshwarlu is suffering such bad luck. As a young man, he wanted to join the Indian Police Service. He cleared the entrance exams and even got selected as a constable. But as fate would have it, he met with an accident just before his medical examination, and injured his leg very badly. He was disqualified and had to make peace with taking up his family’s profession - agriculture. The seasonal nature of his profession doesn’t bring steady income to the household. He struggles to make ends meet. He tries his best to provide his family with a decent life, but what can come out of a yearly income of about Rs 30,000? On top of his weak financial situation, his son is now fighting for his life and he has no means to provide for it. So far, Venkateshwarlu has spent nearly Rs 3 lakhs towards Gnaneswar’s treatment. All his friends came forward to help, but they come from similar financial backgrounds and they cannot afford to help him out anymore. Without the treatment, Gnaneswar’s life is in danger. 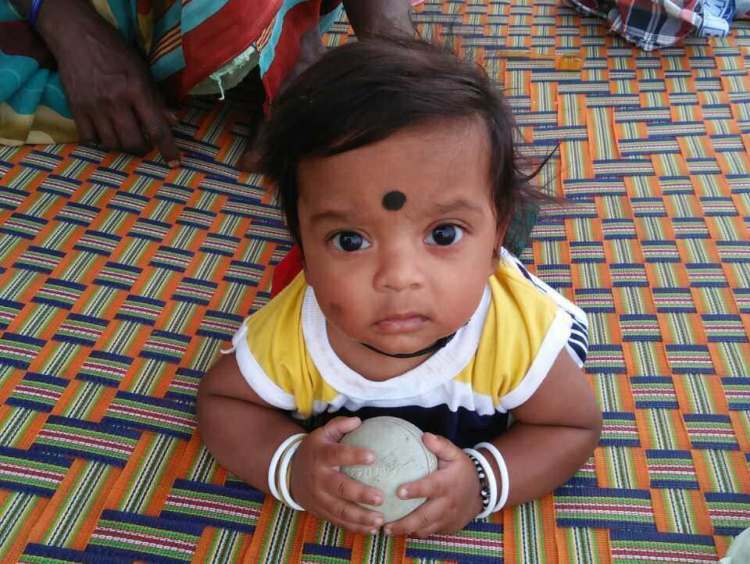 In order to save his son, Gnaneswar needs your help. Only your contribution can provide for his treatment and give him a second chance at life. 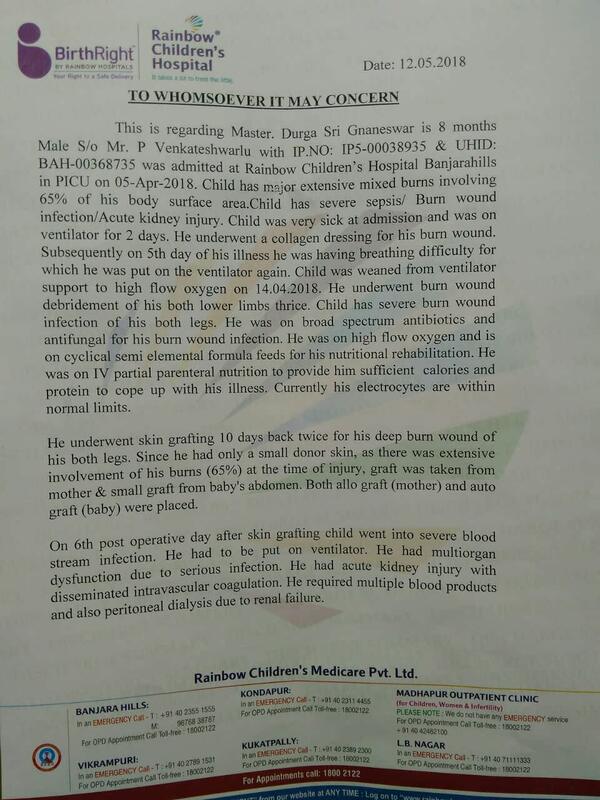 Please help Venkateshwarlu and Anita save their son. Thank you for the wonderful support that you have shown towards Durga's treatment so far.We have some news to share with you today. 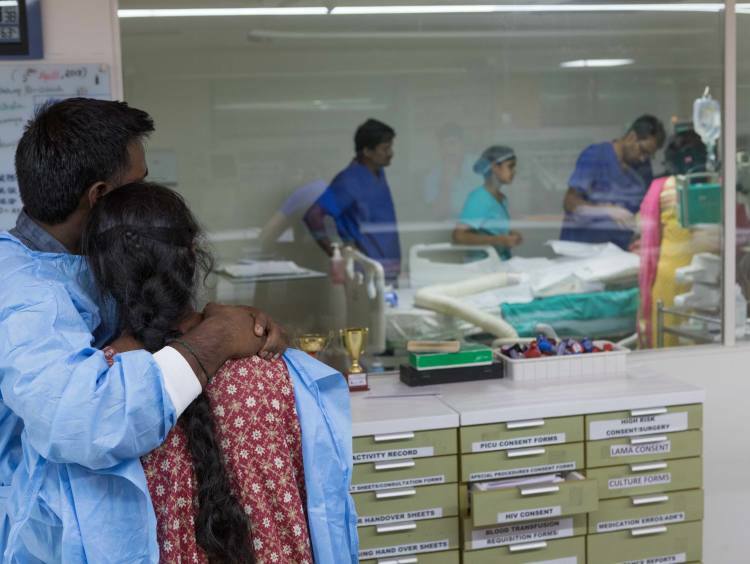 Durga was shifted from Rainbow Hospital, Hyderabad to a hospital in, Bangalore. Once his health stabilised a little, he was discharged and we took the child back to our hometown . He was being offered basic treatment and dressings and was recovering well. However suddenly he developed a few complications and was being treated for the same. Unfortunately, his little body could not take the stress and passed away. 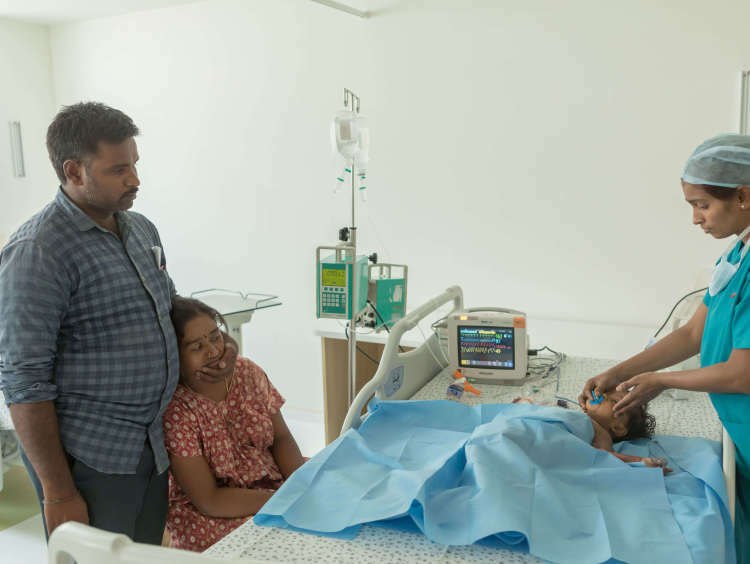 Your timely support ensured that he received the best medical treatment possible. All the funds raised via this campaign have been used towards his treatment. Please do pray for his soul to rest in peace. Thank you for all the love and support you have shown so far. Thank you for the wonderful support that you have shown towards Durga Sri Gnaneswar. He is doing better now when compared to earlier. His wounds are slowly healing but will take some more time before he is completely healthy. Your timely support ensured that he received the best treatment possible. All the funds raised via this campaign have been used towards his treatment. 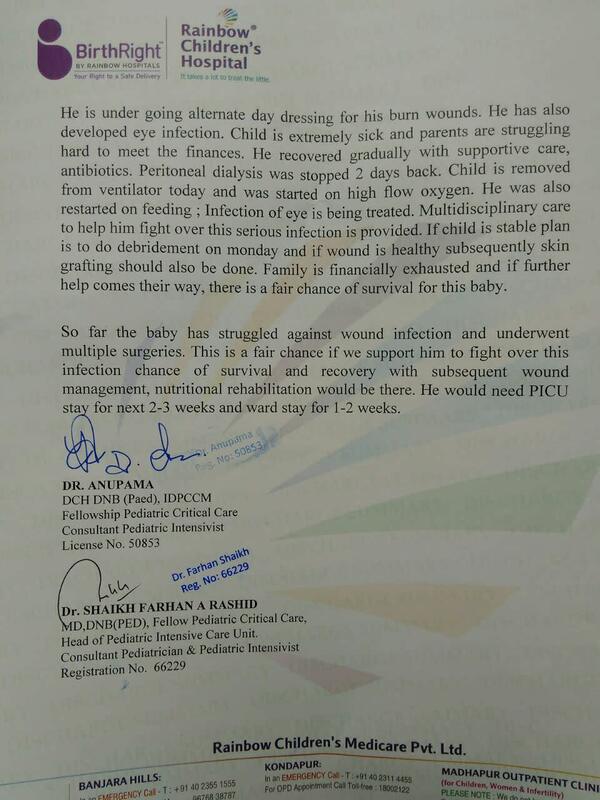 He had been advised for another skin grafting session on 17th May. However, his family got him discharged from the hospital against medical advice to get him treated in a different hospital. 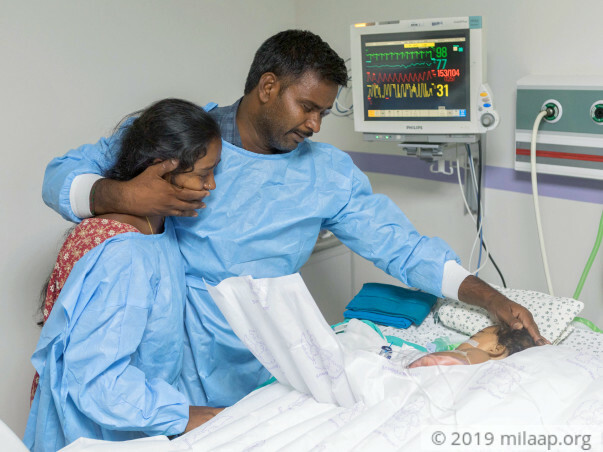 His parents have been informed about the complications that it might cause but his family still opted to get him treated in a different hospital and got him discharged. He has been discharged from Rainbow hospital and the family has left the hospital in an ambulance with a doctor and paramedical staff. All the risks about the transportation, infection and others have been informed to the family. Thank you for the wonderful support that you have shown towards Durga. Please do pray for his health and speedy recovery. Our prayers are with the family and Durga Sri Gnaneswar. 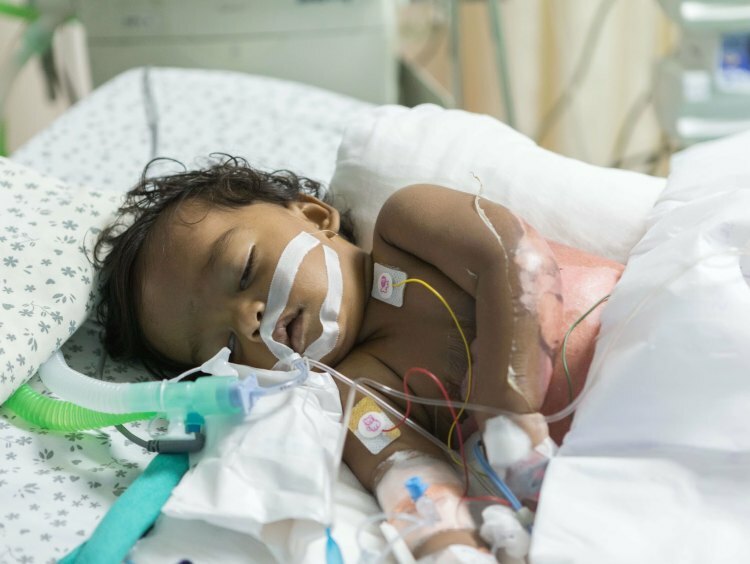 Durga's renal failure is better and we have stopped peritoneal dialysis and today child is was started on high flow oxygen. On Monday he needs to undergo debridement of his burn wound infection and if wound is better then skin grafting.